It may not rhyme, but those 11 words are pretty profound. When I heard RuPaul say this for the first time on her TV show (RuPaul's Drag Race) I ran to write it down. And now she has a new book out, "Workin' It! 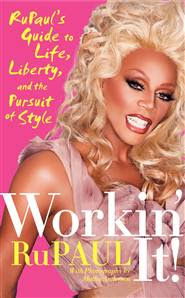 RuPaul's Guide to Life, Liberty, and the Pursuit of Style" in which SHE wrote it down for us. And the empowering spirit behind those words? THAT'S poetic. I am a serious devotee of the DragRace, and honestly, in every single episode, RuPaul says or does something that I find absolutely brilliant or inspiring or honest. She's a pretty incredible role model. I love RuPaul. She does drop some serious pearls of wisdom in her show. Will have to check out her book (books?). It always amazes me how profound Sister Ru really is. I'm not a huge fan of reality shows, but she, at least, has something real to say in them.